Everything you need for Lessons 1-7 of Essentials, including reusable supplements you'll use throughout the curriculum! -None. See notes below if the student needs handwriting instruction. -If needed, use the ten optional Pre-Lessons in the 1-7 Teacher's Guide to strengthen foundational skills before beginning Lesson 1. There is a Placement Test to help you determine the right starting point for each student. This set includes all the components of Essentials needed to teach the first seven lessons of the curriculum - typically a semester to a school year depending on your pace - to one student. 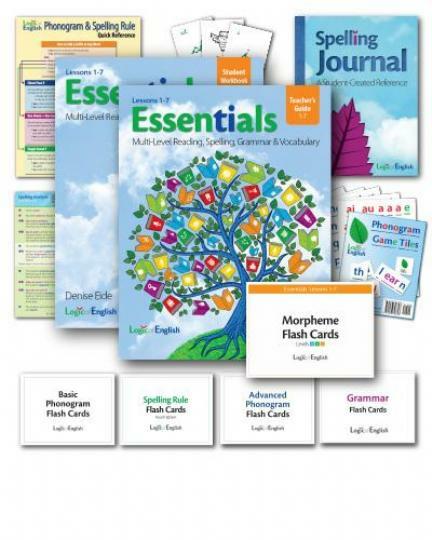 -The Essentials Reader, with accompanying Student Activity Book and Essentials Reader Teacher's Guide - reading comprehension supplement, recommended with Essentials for struggling readers age 8 and up. Essentials does not teach handwriting. Students may complete Essentials lessons with either cursive or manuscript handwriting; the sample text is in a standard bookface font to allow greater flexibility. This Complete set includes Phonogram Game Cards - Cursive. This enables students to practice reading the phonograms both as they appear in books and as they appear in writing. If the student struggles with handwriting or needs handwriting instruction, introduce either cursive or manuscript using The Rhythm of Handwriting. The Essentials Pre-Lessons include a suggested schedule for integrating Rhythm of Handwriting instruction. After completing these lessons, add the new materials for Lessons 8-15. Continue with Lessons 16-22 and 23-30 when you are ready for them. At a pace of one lesson per week, you can complete all 30 lessons in a school year; at a pace of half a lesson per week you will complete about 15 lessons in a school year.